Spontaneous Combustion Miracle in Mahavamsa! Post No.1294; Dated 17th Sept. 2014. This is my Sixth Research Article in the Mahavamsa series. I have already listed the miracles in Mahavamsa. But I did not deal with the Miracles of Buddha in that article. There are lot of miracles in Buddha’s life like in the life stories of Krishna and Jesus. So I am not dealing with them here. But one remarkable miracle is recorded in the Mahavamsa. 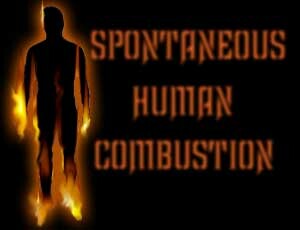 It comes under the category of Spontaneous Human Combustion (SHC). 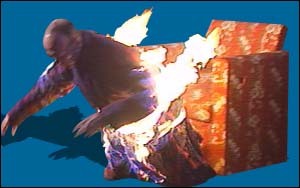 What is spontaneous Human combustion (SHC)? A human body bursts into flames without any rhyme or reason or external contact with fire. Only people who believe in miracles and paranormal things believe that this can happen. But scientists who came across such things as late as in 1992, struggle hard to explain with all the scientific terms they know: methane in the body, fat in the body struck by lightning, wick effect etc. Nothing is satisfactorily explained so far. Moreover they did not know what is recorded in the Hindu scriptures. But what puzzled firemen and forensic experts is that the whole body including the bones except legs burnt to ashes! Why didn’t the legs burn? How come the bones burnt which is not even possible in Electric crematoriums where the temperature is 1000 degrees C? These are the puzzles. 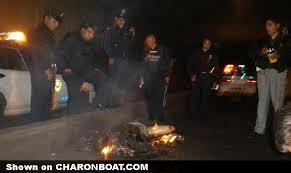 Hindus collect bones after the cremation even in London after cremating the body in the electric crematorium! 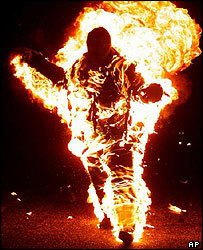 Stranger than this was the burning of the body without damaging the clothes! But these were not recorded properly, so scientists ignored them. Hindus strongly believe in SHC, because they have lot of anecdotes in their scriptures. They never thought that they are fire accidents or concocted stories. Saivite saint Tiru Jnana Sambandhar and Vaishnavite woman saint Andal burst into flames and merged with God. But atheists explained them as unfortunate fire accidents!!! Ramalinga Swamikal burst into flames and merged with Jyothy, his disciples believe. Tiruppanalvar and Nandanar merged into Jyoti/fire. Gopal Naik sang Deepak Raga and burst into flames in front of Moghul emperor Akbar. Tamil woman Kannaki burnt Madurai by throwing her breast. Pattinathar and Adi Shankara lighted their mothers’ funeral pyre by looking at them! In Mahavamsa we come across an anecdote where Kasyapa goes round the Buddha’s body three times and it spontaneously lit the funeral pyre! (See Chapter 30 of Mahavamsa). More interesting is the SHC reported in fifth chapter. A monk bursts into flames. Buddhists call this Tejo jhanavasena. The explanation for this term is that a meditating monk concentrates all his thoughts on the concept of fire (tejo) and the effect is a fire arises in his body which consumes him. Once a person went into a forest and fell in love with a wood nymph called Kunti. She gave birth to two children and they grew up and attained supernatural powers after practising Buddhism. One of them was bitten by a poisonous insect. Immediately the younger one asked him what would relive him of pain. The elder one asked for ghee to get rid of the poison in his body. Enough ghee was not available. The elder one decided to go into Nirvana. He sat lifted up in the air. Suddenly he burst into flames and the bones only remained after he burnt his flesh. The king collected his bones and did the funeral rites. After finding the Thera’s sickness, he built many hospitals for the Bhikshus. Hindus have already heard such stories and so they are not surprised. But it is a very rare phenomenon. In the 5000 year old Hindu history we come across a handful of SHC cases only! 2500 ஆண்டுக்கு முன் தமிழர்—சிங்களவர் உறவு!